Acne is often deemed a rite of passage for teenagers but it doesn't have to be. In fact, it shouldn't be. Acne is essentially when dead skin cells, sebum and bacteria clog up the pores (hair follicles) of the skin and thus blemishes form (blackheads, pustules, whiteheads, etc.). These lesions need to be dealt with before the bacteria can cause them to become infected. Also, it is not a good idea to pick at them yourself because they can become inflamed and infected even more, leaving scars that pit the face, decreasing self-esteem and causing someone to feel worse than they already are. Acne often doesn't disappear after the teenage years either. Many women, because of hormones, continue to have acne well into their 40's. Why suffer through that? Finding the right treatment for yourself is the best way to prevent and treat acne in the first place. I'm 47 and still suffer from minor acne lesions on my chin due to having an IUD contraceptive device. 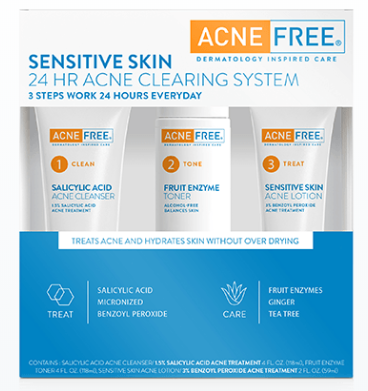 AcneFree is well known for their ability to treat acne with gentle and effective kits and products. They have kits and products to meet everyone's needs. Today I will be reviewing the Sensitive Skin 24 Hour Acne Clearing System. This kit uses low doses of salicylic acid and benzoyl peroxide to help clear up blemishes and breakouts. The reason I wanted to try this one is because I cannot use higher doses of benzoyl peroxide, it is too drying on my skin. Salicylic acid is fine, it is a BHA (beta hydroxy acid). Not only does it help exfoliate the skin but it also helps kill bacteria. Benzoyl peroxide's main goal is to kill bacteria. It also contains ginger and oat extract to give sensitive skin the extra care it needs. This 3-step system gives sensitive skin all the care it needs to fight acne and banish breakouts and prevent new blemishes from forming without irritation. Step 1.CLEAN: The Salicylic Acid Acne Cleanser contains 1.5% salicylic acid. This gentle, deep-cleansing acne wash removes pore-clogging dirt and excess oil to help reduce existing blemishes and prevent new ones from occurring. Botanical extracts help to soothe the skin. Step 2. TONE: This alcohol-free balancing toner is formulated with fruit enzymes for mild exfoliation. The refreshing, soothing and anti-redness formula helps balance skin tone. Step 3. TREAT: Formulated with 3% micronized benzoyl peroxide (small enough to enter pores), this acne treatment absorbs quickly to fight breakouts throughout the day and night. It eliminates 99% of acne bacteria and provides continuous 24/7 breakout control. It is recommended to begin the treatment regimen gradually by applying Step 3 as a spot treatment. Then build skin's tolerance by increasing usage to once every other day. Build up to twice a day, as tolerated, morning and evening, if no irritation occurs. You can see how the acne was only on my chin. After using the system for a month, my skin cleared up and even the redness was gone. I prefer a sensitive skin system because of the lower level of benzoyl peroxide. The salicylic acid level is great, I think even a 2% could work here because it is such a great acne fighting medication. This product works well and works quickly. Even after 24 hours you will notice results. That is why it is called a 24 Hour Acne Clearing System. I tend to mostly get acne during the changing seasons of fall and spring for the most part though. During winter and summer it is usually under control. Unfortunately that corresponds to my vertiginous migraines! Ugh. I would recommend this product to anyone with acneic skin who has sensitive or drier skin. Even normal skin too. I would not recommend it for those with oilier skins. For those I would recommend their other kits. The AcneFree Sensitive Skin 24 Hour Acne Clearing System can be found online at www.amazon.com. It can also be found in mass market stores like Walgreens, Rite-Aid, CVS, Walmart, Target and Ulta Beauty. Like AcneFree on Facebook: https://www.facebook.com/AcneFree/; Follow AcneFree on Instagram: https://www.instagram.com/acnefree/ and Subscribe to AcneFree on YouTube: https://www.youtube.com/user/acnefree.